Plants papillose, sometimes pubescent, papillae sometimes mixed with simple trichomes. Stems (0.5-)1-4(-5.6) dm. Basal leaves (often withered by flowering); petiole (0.5-)1-2(-4) cm; blade oblanceolate or oblong, (1.5-)2.5-8(-13) cm × (4-)8-20(-30) mm, base cuneate or attenuate, apex acute, surfaces glandular. 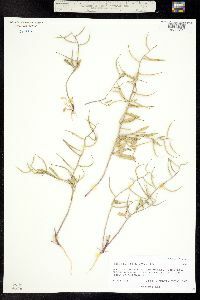 Cauline leaves similar to basal, distalmost subsessile, blades smaller distally. Fruiting pedicels (2-)3-5 mm, glandular. Flowers: sepals purplish, (3-) 4-5(-6) × 0.5-0.7 mm; petals 8-10(-12) × 1-2 mm, claw 6-7 mm; filaments 4-6(-7) mm; anthers ca. 1.5 mm. Fruits slightly curved-ascending, (1.4-)1.8-2.5(-3) cm × 1.5-2 mm, with 8-12 constrictions on each side; style (6-)10-18(-22) mm. Seeds brown, 1-1.4 × 0.8-1 mm. 2n = 14. Flowering Apr-Jul. Waste places, pastures, fields, roadsides, railroad embankments, grassy slopes; 0-2300 m; introduced; Alta., B.C., Sask. ; Ariz., Calif., Colo., Idaho, Ill., Ind., Iowa, Kans., La., Mass., Mich., Mo., Mont., Nebr., Nev., N.Mex., N.Y., N.Dak., Ohio, Okla., Oreg., S.Dak., Tenn., Tex., Utah, Wash., Wyo. ; Europe; Asia; n Africa; introduced also in South America. 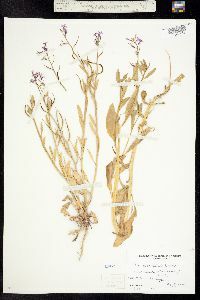 Chorispora tenella appears to be most widely distributed in Colorado, Nevada, and Wyoming, of all the provinces and states listed above. 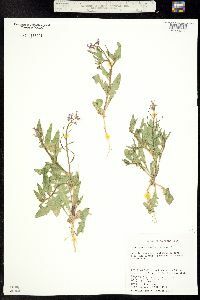 Annual herb with a large taproot 2 - 4 m tall Leaves: alternate, stalked, 3 - 10 cm long, to 4 cm wide, lance-shaped to narrowly egg-shaped, shallowly lobed to toothed (mostly lower leaves) or wavy, lobes sometimes pointed, glandular-hairy. Flowers: borne terminally on a branch, in a loose, branched cluster (raceme). 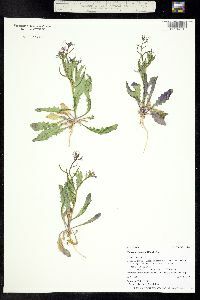 Racemes to 25 cm long with glandular-hairy stalks. Sepals four, purplish, to 6 mm long, 1.2 mm wide, linear, forming a "tube" beneath the petals, glandular-hairy. Petals four, bluish purple, about 1.2 cm long, bases narrowed. Stamens six. Anthers yellow. Fruit: a long, narrow pod, thick-stalked (stalk to 5 mm long), ascending, 2 - 3 cm long (without beak), cylindrical, upcurved, glandular-hairy, with a 1 - 2 cm long beak. Seeds many. 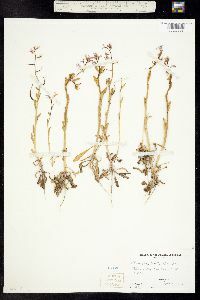 Stems: multiple from base, branched, glandular-hairy. Glands yellowish orange. Habitat and ecology: Introduced from Asia. Established as a weed in the western United States. 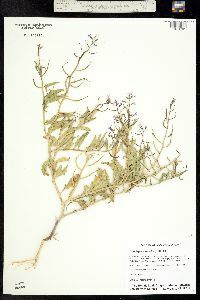 In the Chicago Region it is an uncommon plant found in nurseries, stockyards, and along railroads. While once more abundant in the Chicago Region, it has virtually disappeared since its discovery and peak of incidence around mid 1970's. Etymology: Chorispora comes from the Greek word chori, meaning separate or apart, and spora, meaning seed, which refers to the separate fruits. Tenella means tender or delicate. 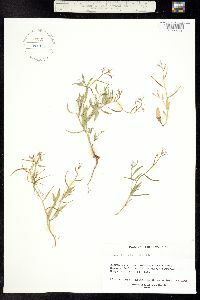 Duration: Annual Nativity: Non-Native Lifeform: Forb/Herb General: Annuals, sometimes becoming somewhat bushy or sparingly branched, 5-60 cm tall, stems leafy, erect or decumbent, branched basally and distally, herbage with small nodes, sparsely pubescent whit short, gland-tipped hairs or hairs mixed with simple trichomes, plants with watery, pungent sap, not arising from a basal rosette. Leaves: Alternate, oblanceolate or oblong, 1.5-13 cm long and 4-30 mm wide, margins sinuate-dentate, bases cuneate to attenuate, tips acute, surfaces glandular, basal blades petiolate with petioles 0.5-4 cm long or cauline becoming slightly reduced and sessile near branch tips. Flowers: Lavender to bright purple (rarely white), large and showy, petals oblanceolate, 8-12 mm long and 1-2 mm wide, with long claws 6-7 mm, these strongly differentiated from petal blades, sepals erect, linear, purplish, 3-6 mm long and to about 1 mm wide, free but forming a tube, stamens 6 with 2 shorter than the others (tetradynamous), filaments 4-7 mm long, not dilated basally, anthers narrowly oblong to linear, to 1.5 mm long, nectar glands 2 or 4, lateral, intrastaminal or each side of the lateral stamens, stigmas minute, flowers borne in racemes proximally and at branch tips. Fruits: Cylindrical siliques, sessile and slightly curved-ascending and spreading, 1.5-3 cm long and 1.5-2 mm wide, with 8-12 constrictions on each side between the seeds, style 6-22 mm long, stigmas conical, with 2 decurrent, strongly connivent lobes, fruits ind Ecology: Introduced, found in waste places, pastures, fields, and on roadsides, railroad embankments, and grassy slopes, from 0-7,500 ft (0-2286 m); flowering April-July. Distribution: Widespread across most of the United States, less common in the easternmost states. Notes: The large, purple, showy, windmill-like flowers of this species help make it a stand-out among other mustards. 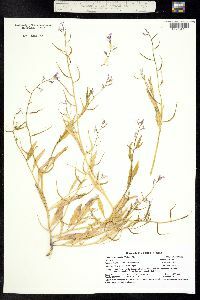 The petals have long, erect claws and slender, spreading blades. 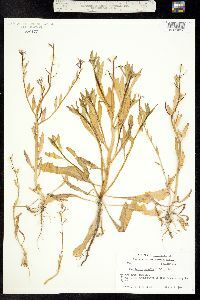 FNA notes this species is considered a noxious weed. Look for it in Arizona in Oak Creek Canyon and Coconino county. Ethnobotany: Unknown Synonyms: Chorispermum tenellum, Crucifera tenella, Raphanus monnetii, R. tenellus Editor: LCrumbacher2012 Etymology: Chorispora comes from the Greek choris, "separate, apart," and spora, "seed," referring to the septate (separated by a septum) fruits, and tenella comes from the Latin meaning "quite delicate, dainty". 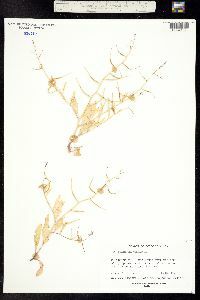 Widely branched annual 2-4 dm; stem, axis of the infl, and pedicels sparsely beset with stipitate glands; lvs lanceolate to oblanceolate, 3-8 cm, with a few low teeth; sep 7 mm; pet blue-purple, ca 12 mm; pedicels 2-5 mm; frs ascending, the body 2-3 cm, the beak 1-2 cm; 2n=14. 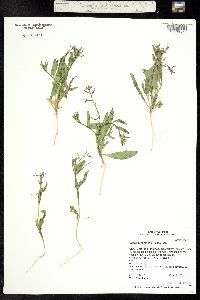 Native of c. Asia, established as a weed in w. U.S. and occasionally adventive in our range. May-July. 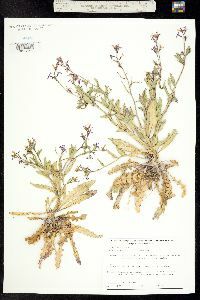 Malcolmia maritima R. Br., an Old World sp. habitally similar to C. tenella, but eglandular and without the cross-partitions in the scarcely beaked fr, is adventive on L.I.